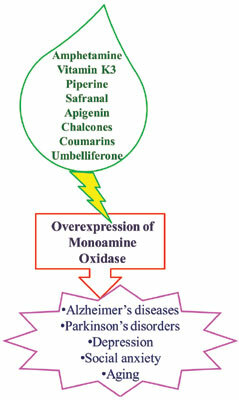 Background: The computational development of human monoamine oxidase (MAO) inhibitors led to advancement in drug design and the treatment of many neurodegenerative diseases and neuropsychiatric disorders. The computational development of human monoamine oxidase (MAO) inhibitors led to advancement in drug design and the treatment of many neurodegenerative diseases and neuropsychiatric disorders. Different natural heterocyclic structures are reported to display selective MAO inhibitory activity by preclinical and in-silico modeling. Objective: Currently, the major interest is devoted to the study of natural based therapeutic agents from the different categories. Therefore, we presenting the review to critically discuss and outline the recent advances in our knowledge on the importance of natural and natural based ligand-MAO insilico methods for novel MAO inhibitors. Discussion: Several natural and related synthetic heterocyclic compounds such as coumarins, β- carboline, piperine, naphthoquinone, morpholine, caffeine, amphetamine moreover flavonoids, chalcones, xanthones, curcumin are discussed for their MAO inhibitory profile along with molecular docking and quantitative structure-activity relationship studies. Conclusion: It is clear that, by this computational drug design approach, more particular, reversible and potent compounds can be proposed as MAO inhibitors by exact changes on the fundamental framework. 3D-QSAR, in-silico docking, monoamine oxidase, CoMFA, natural monoamine oxidase inhibitors.